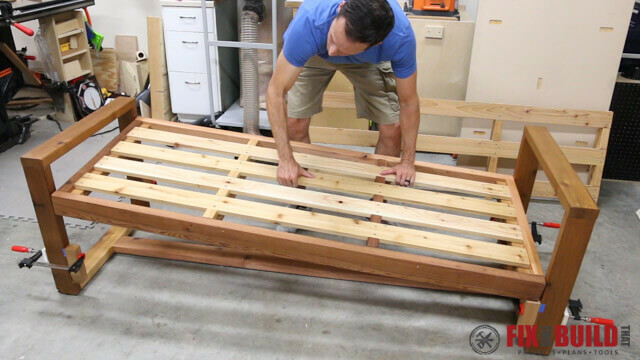 Today I’m going to show you how to make a DIY Modern Outdoor Sofa. We’re in the process of overhauling our back deck and this outdoor couch is going to be the cornerstone of the patio set. I designed it to be a great place to chill with deep cushions, a tilted back and enough room to comfortably seat three adults. 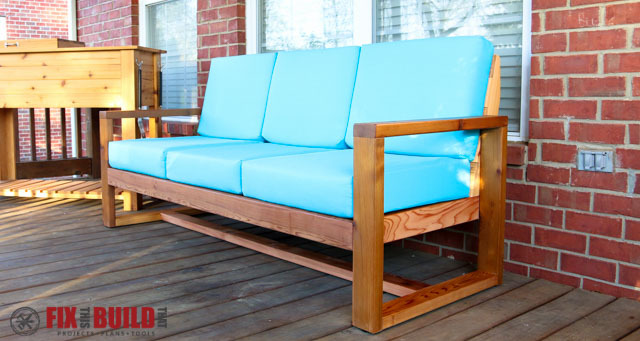 And with clean lines this modern sofa makes a great statement on our back porch. I only used 2×4 and 1×4 materials in the construction which are readily available at the home center. 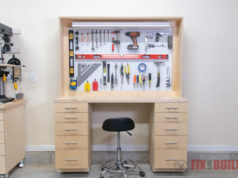 You don’t need a whole shop of tools to build this either. 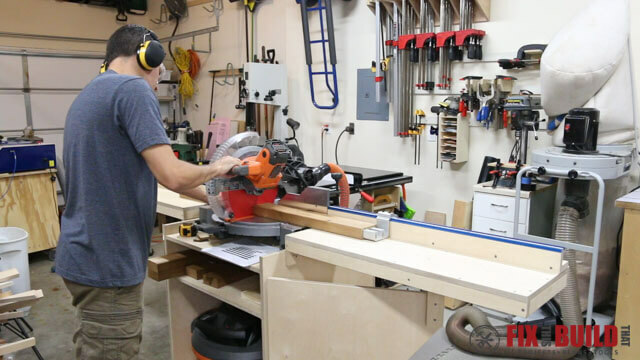 With just a mitersaw, drill, and a circular saw you can do everything I show here. 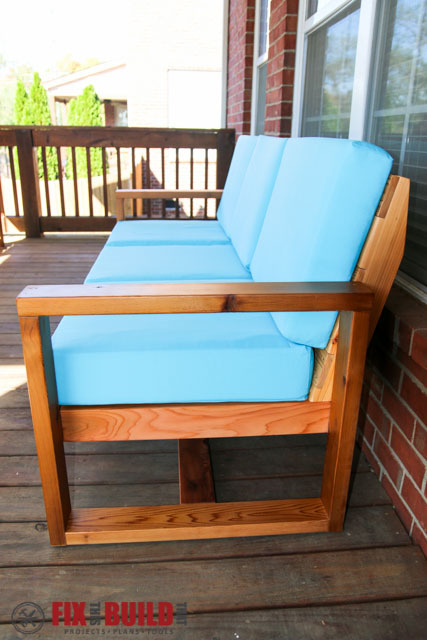 Being an outdoor sofa it’s made from cedar and I used exterior screws to withstand the elements. This was a perfect opportunity to partner with SPAX on this build and try out their new HCR-X exterior screws for the joinery. I’ll tell you more about them later and how they saved me a bunch of drilling. I’ve got detailed plans and a video for this build available below. 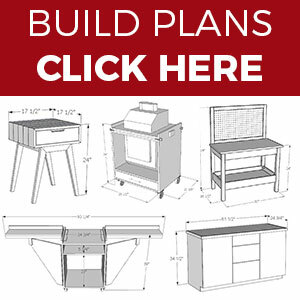 The video will show in real time how everything fits together and the plans include a detailed cut list, step by step instructions and 3D CAD drawings of each step. Read on to see how you can make your own! 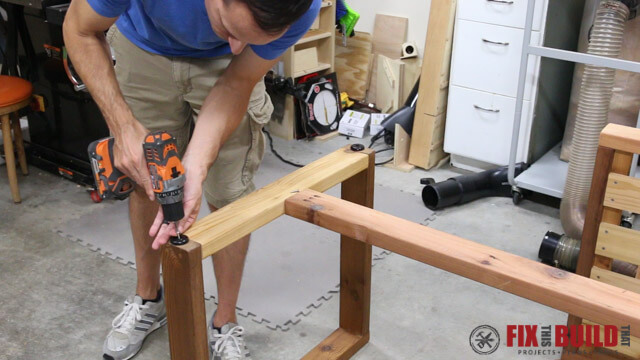 Start by cutting parts for the outdoor sofa side assemblies from cedar 2×4. 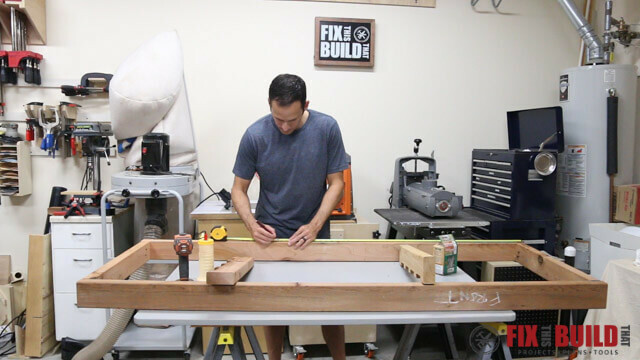 Each side needs a 27-1/2″ top, a pair of 22-1/2″ uprights and a 24-1/2″ base. 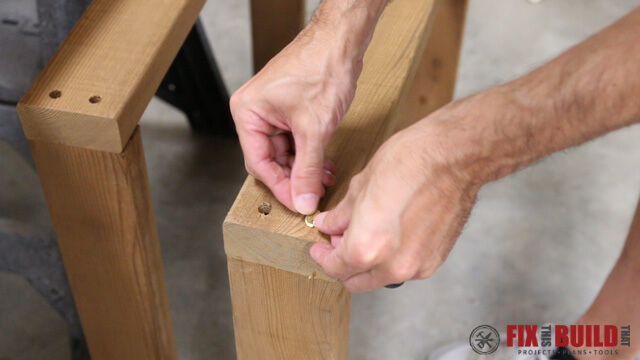 Begin assembling the sides by drilling ⅜” holes halfway through the tops of the armrest on each end. 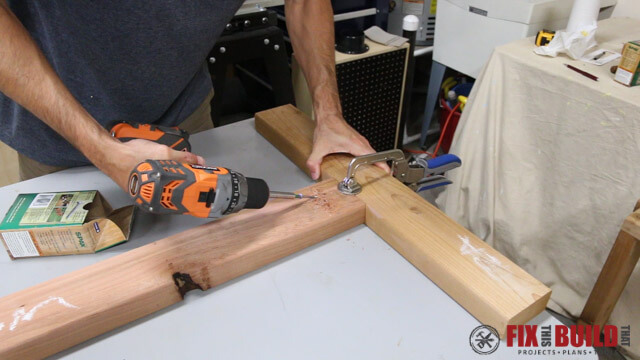 Drive 2-½” screws into the holes to join the boards. You’ll fill these holes with cedar plugs later for a nice clean look. You could also use pocket holes here and in most other parts of this build if you prefer that method. 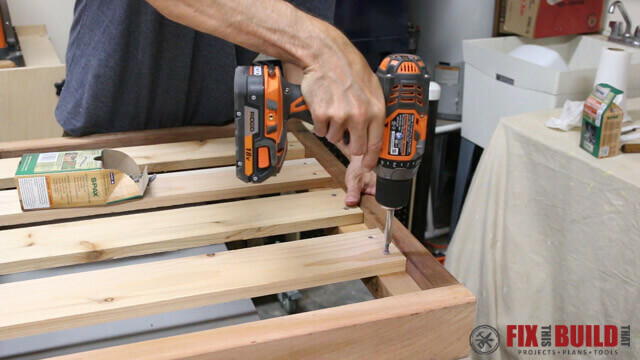 Repeat this process for the other side and before moving on drill holes at the bottom of each assembly for attaching the base of the armrest later. 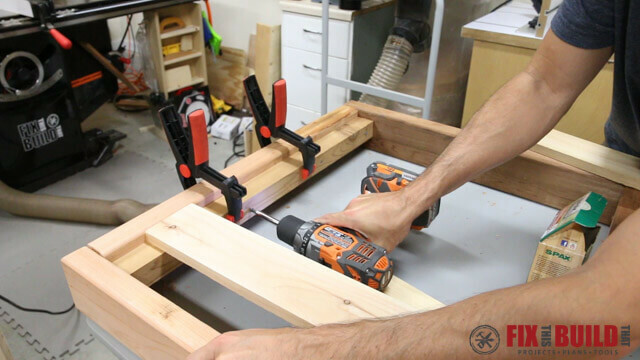 You can cut 3/8″ plugs with a 3/8″ plug cutter to fill the holes in the armrest. 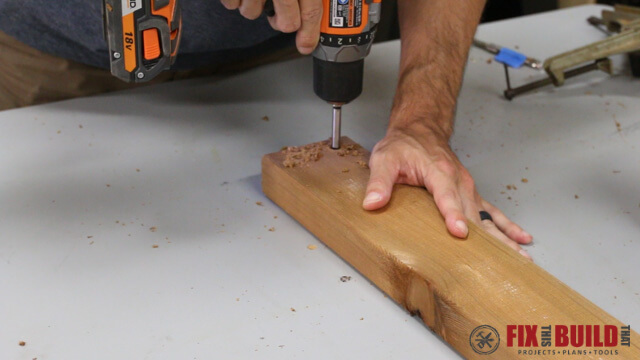 A plug cutter is kinda like a drill bit with a hollow center that gives you a perfectly matched plug from the same material as your armrests. 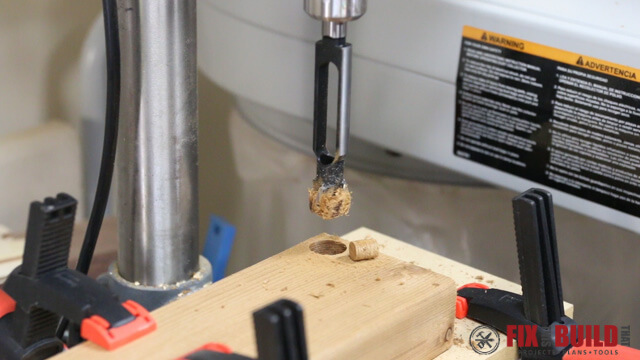 If you don’t have a drill press or plug cutter you can also buy cedar dowels for plugs. Use a generous amount of glue on the plugs and install them just proud of the surface. After the glue is dry sand them flush to the surface. 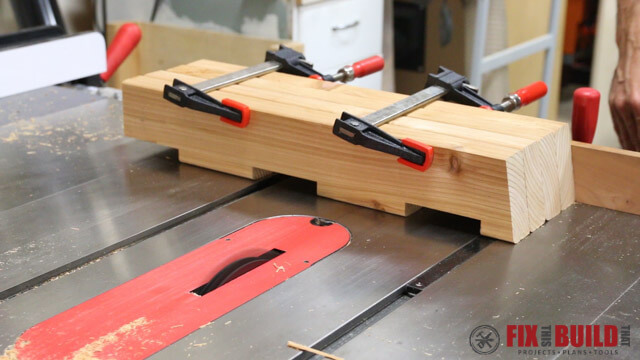 Next you’ll cut the 2×4 base stretcher that connects the sides to 69″. This was initially just a design element but it ended up adding a lot of stability to the whole sofa. 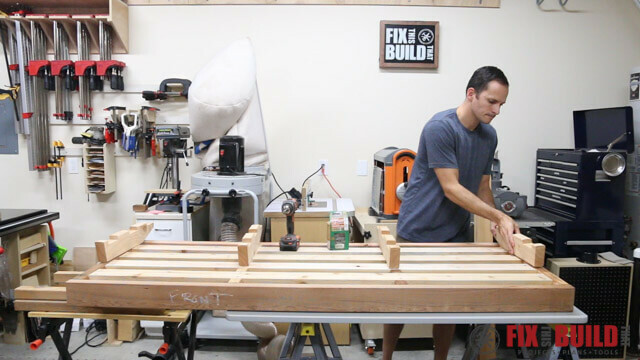 Flip it and the armrest bases upside down and connect them with 2-1/2″ screws. 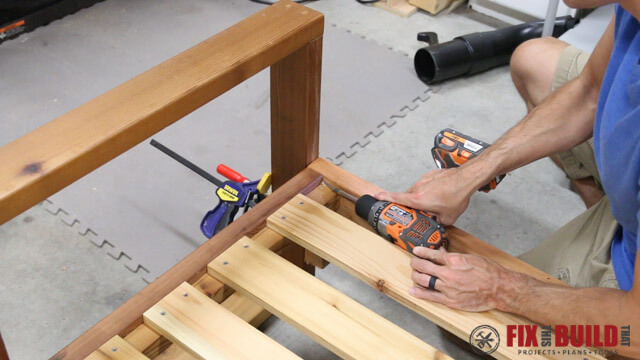 Flip the stretcher back over and bring in the armrests and attach them with 2-1/2″ screws through the holes you predrilled earlier. Fill these holes with cedar plugs as well. 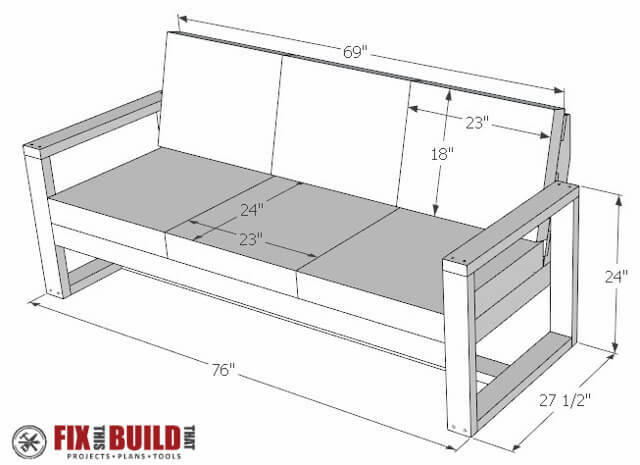 Now you’ll move to the seat base for the modern outdoor couch. 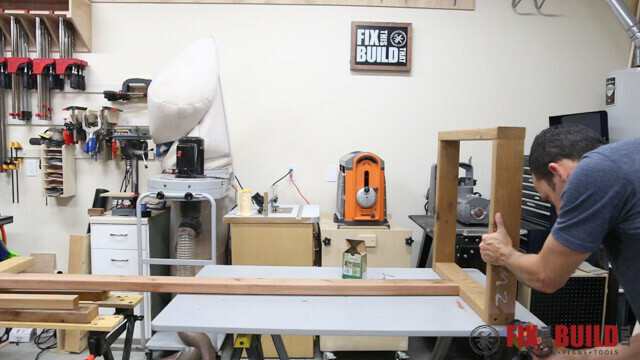 The base frame is made from 2×4’s and needs a front and back each 69″, two sides at 24-1/2″ and two inner supports at 24-1/2″. The two inner supports need notches cut in them to hold the 1×4 seat slats. 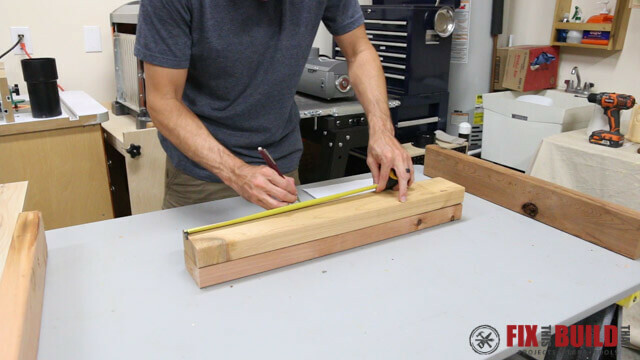 Lay out four notches 3-1/2″ wide by 3/4″ deep on the inner supports. 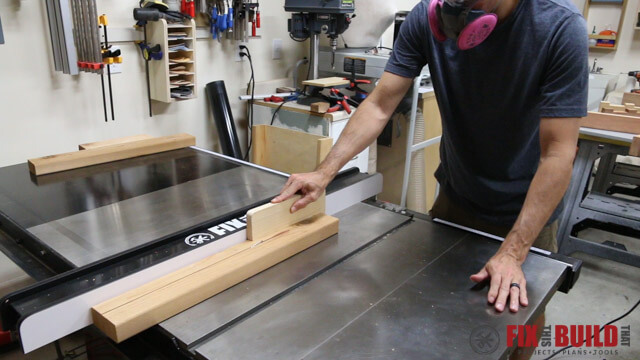 I used a dado blade on the tablesaw to cut out the notches on the boards. 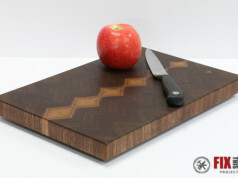 You could also make them with a series of cuts within the notch area with a circular saw then clear out the waste with a chisel. 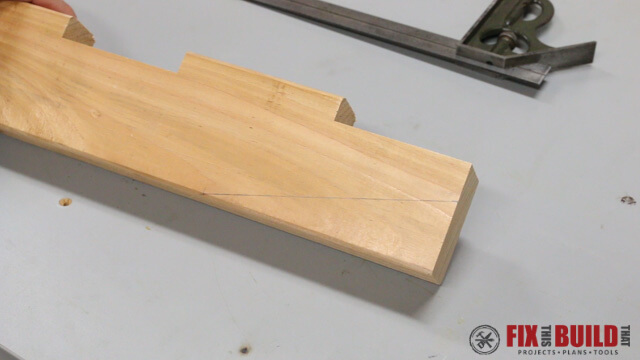 You’ll also need two 24-1/2″ cleats to support the outer ends of the 1×4 slats. Rip a 2×4 in half for these or use 2×2 material. 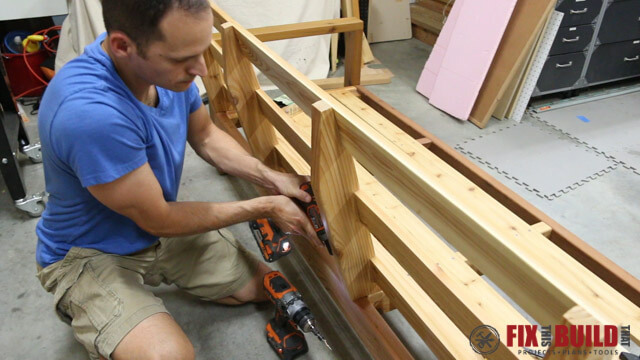 For the final seat parts cut four 1×4 seat slats to 66″. 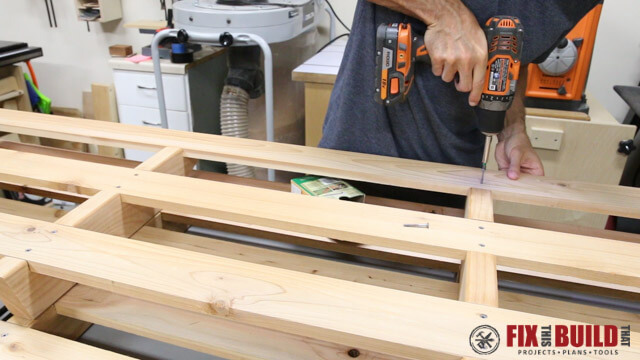 Start the seat assembly by joining the outer frame with glue and 2-½” screws using clamps along the way to help square things up. 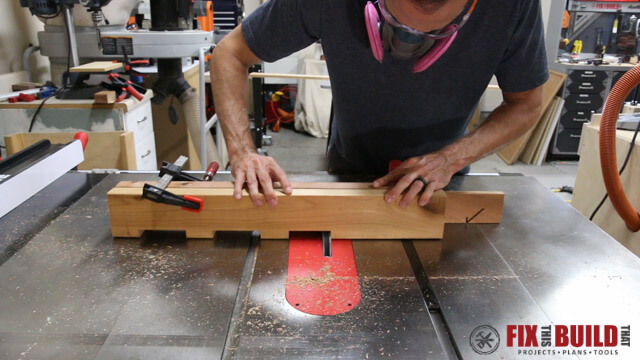 For the inner supports, space them evenly with the center of the boards 23″ from the outer edge. 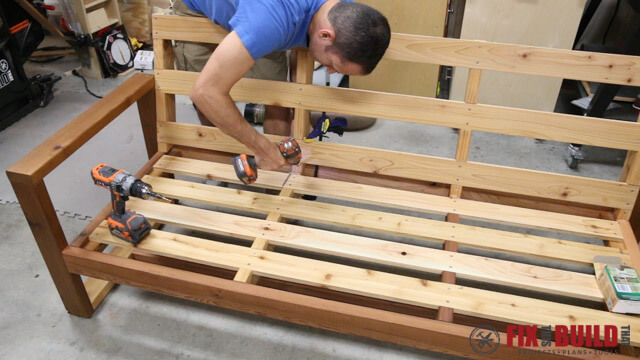 Do the assembly upside down so the top surface will be flush when you finish. 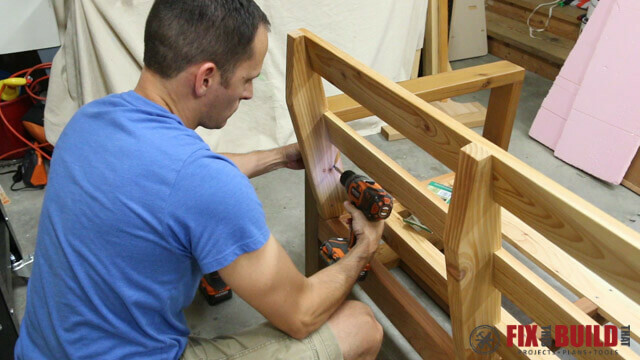 Now lay the 1×4 seat slats into the notches and attach them with 1-½” screws. These new HCR-X exterior screws from SPAX are perfect for this application. They have a corrosion resistant coating for outdoor use and like all SPAX screws, they don’t require predrilling. 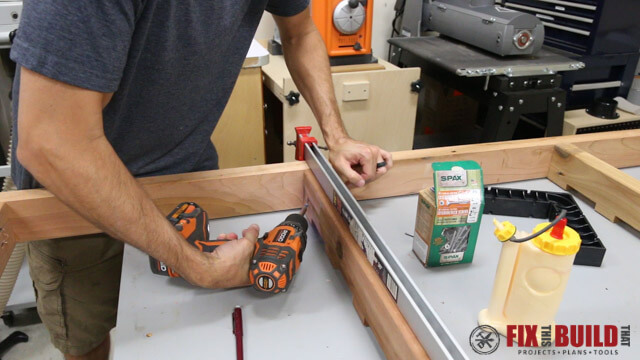 This was great when screwing in all these slats because it saved me from predrilling 32 holes. 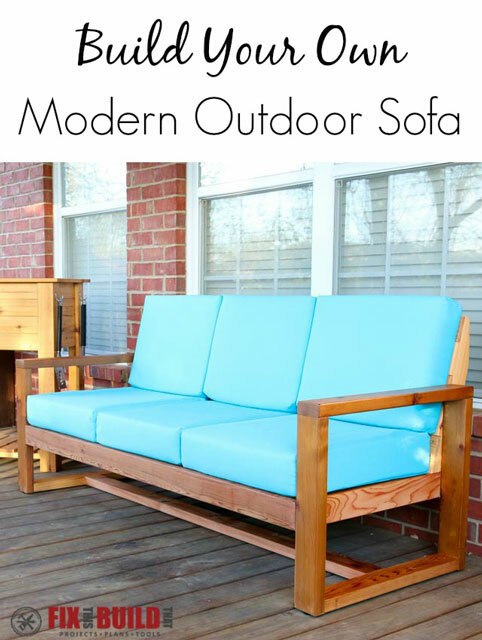 Next you’ll build the modern outdoor sofa backrest. 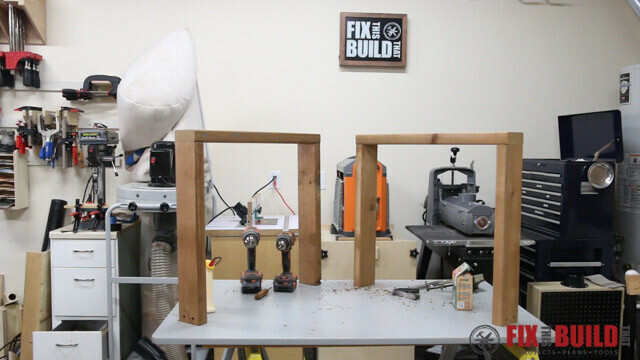 From 2×4’s, cut four uprights to 21″ with 15 degree angles on the bottom end. The uprights will be connected by 1×4 slats similar to the seat base. 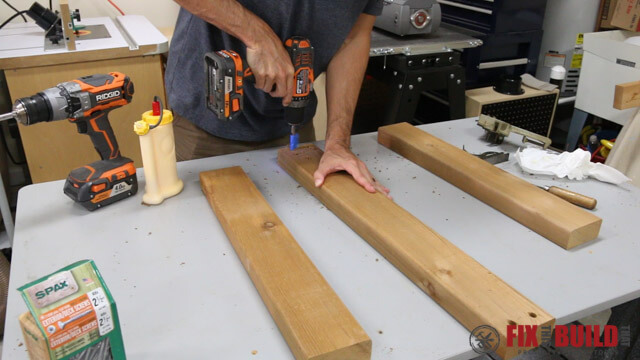 Lay out three 3-1/2″ wide by 3/4″ deep notches and cut them with a dado blade or circular saw as before. Now is a great time to sand everything and apply finish. 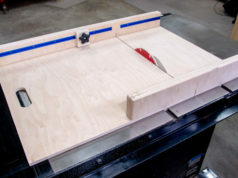 It’s much easier to work with the large flat assemblies than to try to sand into corners once the sofa is put together. 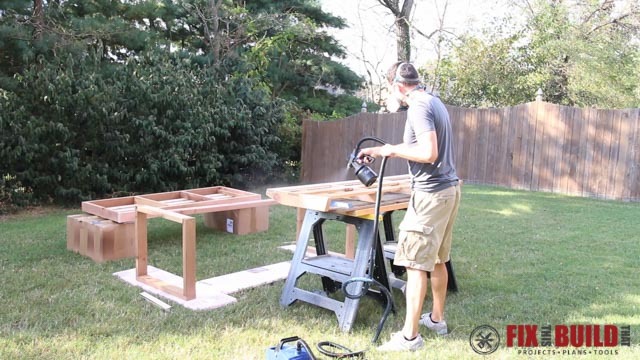 Sand to 150 grit and apply 3 coats of exterior spar urethane. Before assembly install rubber feet on the bottom of the sides to minimize contact with water. 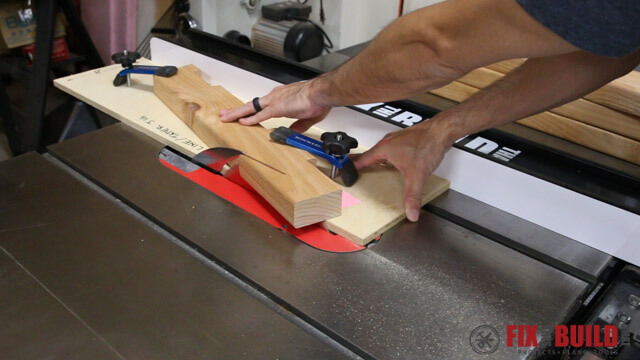 Clamping some temporary blocks to the sides to position the seat which should be 12-1/2″ to the top of the seat. 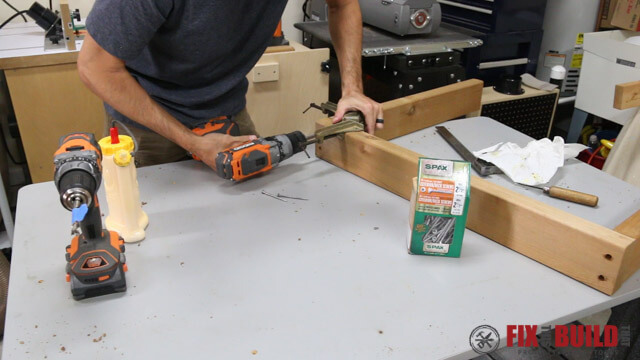 Put the seat in place and secure it to the sides with two 3-¼” screws per corner. We went full out DIY on this build. 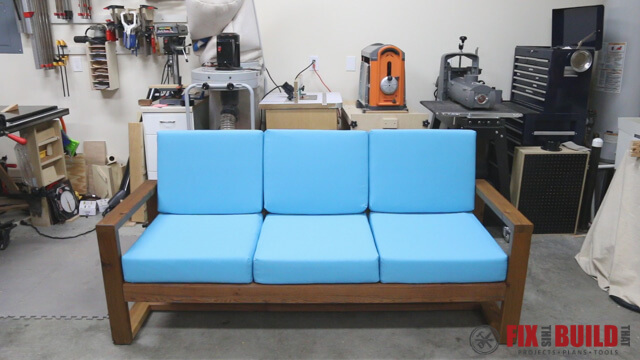 My wife made the cushions with help from this video on How to Make Easy Box Cushions. The base cushions are 24″ deep and 23″ wide and the back cushions are 18″ tall and 23″ wide. You can also purchase cushions online or at a local store to fit your needs. The fabric my wife used was an outdoor fabric and the foam was regular density foam from Mybecca. Even though the sofa is outdoors it is still covered, so we didn’t go for the exterior foam which was 2x the cost. We used 5″ foam for the seat and 3″ foam for the back. 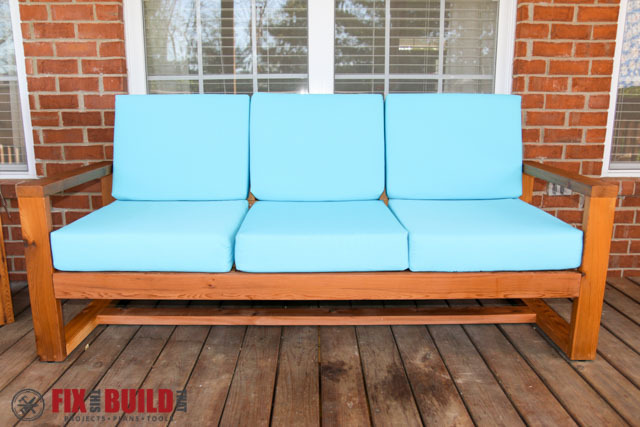 If you want to see more patio furniture like this modern outdoor sofa then head over to my Outdoor Projects page where I have all kinds of projects for the great outdoors. SPAX provided me with product and/or monetary compensation as a sponsor of this build. All opinions are my own and are not filtered by the sponsor.